Barefoot Bubbly Review. Yes, Please. 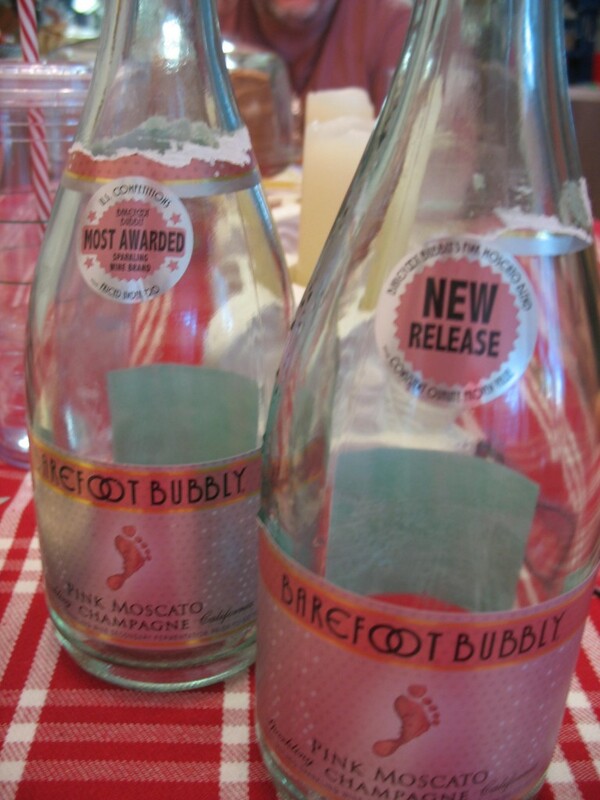 If it’s time to celebrate, then it’s time for a Barefoot Bubbly review! I subscribe to the tenet that one doesn’t need much of an excuse to celebrate. Found my keys in under five minutes? Didn’t trip on my run? My favorite snacks are on sale at Costco? Specifically, time to crack open the Barefoot Bubbly Pink Moscato! I have literally opened a bottle simply because I made a cake and invited a few friends over. Life is short (and long) and it doesn’t ever, never ever, hurt to enjoy a glass o’bubbly for whatever reason you deem appropriate. There are leftovers in the fridge and I don’t have to make dinner? I found all the sock’s mates from the dryer? My crabby neighbor smiled at me? ALL reasons you need pink bubbly for a celebration! A gentle recap: any celebration deserves bubbly. It’s a motto to live by, y’all! If you ask me (I know yer wondering): This is one of the best champagnes for $20. Technically, it’s not a literal champagne, but a bubbly Moscato. Moscato is sweet, so when you add bubbles, it’s reminiscent of the best sweet champagnes. Either way it’s light, delicious, an adorable pink hue and under $20 – it’s a stinkin’ steal. 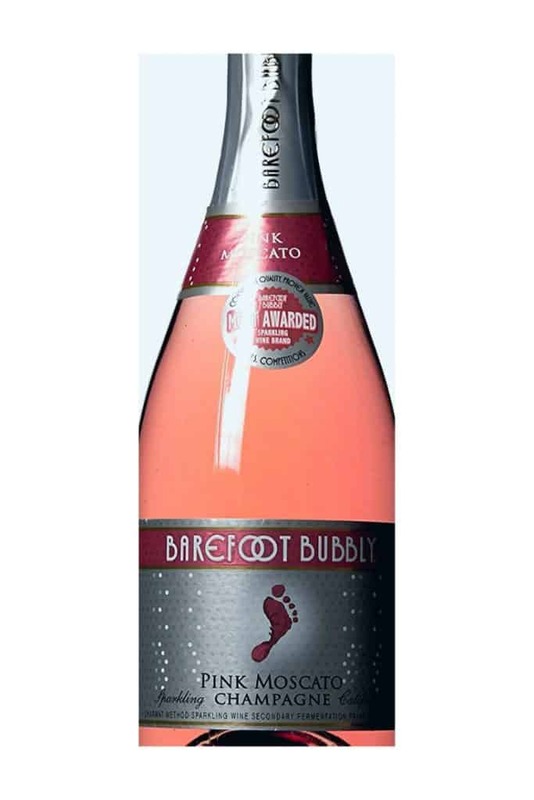 Tasting Notes: Barefoot Bubbly Pink Moscato is sweet & juicy with explosive aromas and flavors. Best served chilled (36-40 degrees F), this bubbly has aromas and flavors of jasmine and Mandarin orange complemented by red raspberry, strawberry and pomegranate. Enjoy the creamy and juicy finish! Please tell me you have tried this sparkling champagne…TELL ME! If you haven’t: the time is N-O-W.
Where in the heck can you find a delightful bottle? Luckily, it’s not too hard. Try locating a bottle locally. You’ll save a couple of bucks per bottle (that’s right, you’ll def need more than one bottle). Start with a local Specs or grocery chain.. If you can’t find it locally, get to ordering! Need to know how to open champagne? #1: Point bottle away from you and start to slowly turn the bottle while holding the cork in place OR slowly turn the bottle while slowly turning cork in opposite direction. #2: As the cork starts to come loose, keep slowly turning the bottle while slowly pulling the cork until you hear the soft POP! My sister came to visit on a weekend. We had a little bit of fun, as sisters are known to do. We had two bottle worth of fun! If you look closely, there’s also cake on the table. It’s how to weekend, y’all. Perhaps I should write an e-book, so everyone can weekend like we do. Mmmmm, pink bubbly and cake weekend. If you leave here with only one thought, I’d like it to be this: Do not be fooled by the Barefoot brand. Wondering how much Barefoot Bubbly Pink Moscato will set you back? Ever’where I go, I see it for around $10 and change – THAT’S IT! The enjoyment of those sweet tickly bubbles is worth every penny. We weekend right, mah babies. Witness my fridge: I practice what I preach. The absolute truth is, I try to keep a bottle on hand at ALL TIMES! because you just never know when you’ll have reason to celebrate. No snow on the ground? You found one last cookie in the bag? Someone said you look too young to be a grandmama?! 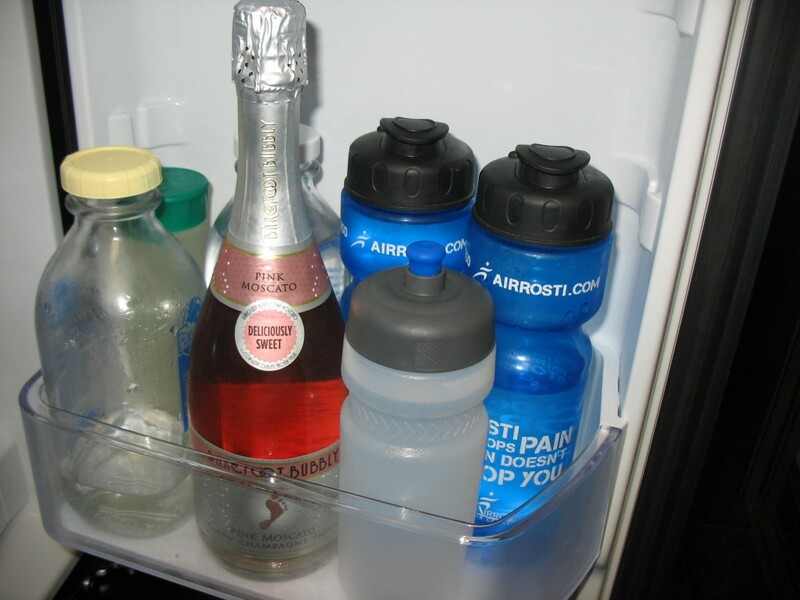 See how important it is to keep a bottle on hand? 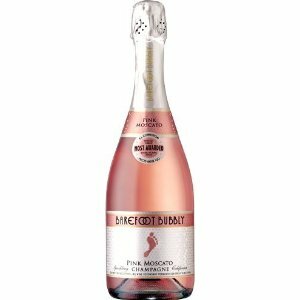 Such a beauty: Barefoot Bubbly Pink Moscato Champagne NV 750 ml. Planning a party and need something fun to slip in the favor bag? They come in individual sizes too! Now, you’re the hostess with the mostest! To many many more happy celebrations, no matter what you are toasting. Updated post – original post date: 3-19-13. Always good to have a reason…any reason! We must be long-lost sisters! I love the Barefoot bubbly and cake of course. 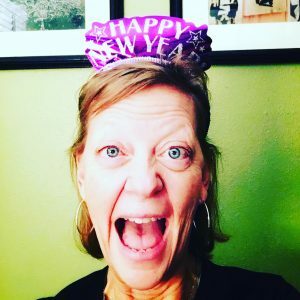 I adore your examples of reasons to celebrate. How about–I woke up to another day. I still have a job to go to tomorrow, but for now I’m home in my pajama pants. I finished my annual exam for another year. The list goes on… Thanks for the inspiration! Your reasons to celebrate are perfect!